A UW grad cements his connection to Husky Athletics with a legacy gift to Forever Washington. 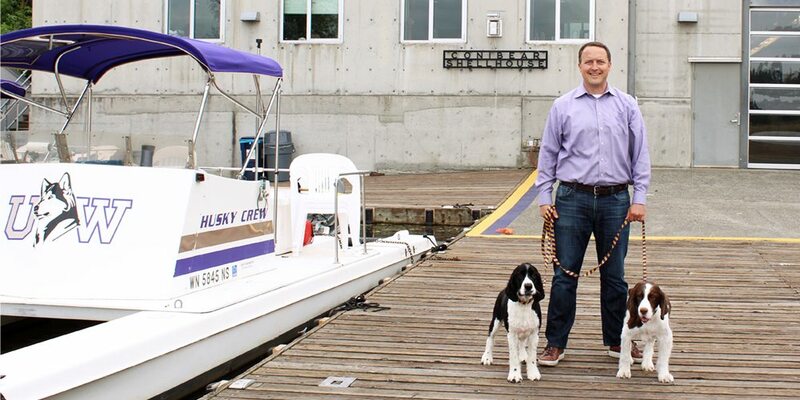 With springer spaniels Riley and Ella at his side, Michael Williams steps out his front door on a tree-lined block just north of the UW, strolls past several fraternity houses, and winds his way toward campus, Portage Bay and Husky Stadium. The trio’s walks are a regular reminder of Michael’s decades-long connection to the UW — a connection that will endure for generations to come. Michael recently joined Forever Washington, a special group of Husky fans who choose to remember UW Athletics in their wills or other estate plans. By establishing an endowed scholarship to support a Washington rower, Michael’s gift will pave the way to an education for student-athletes year after year after year. “It’s good to know that, long after I’m gone, I’ll be able to continue to provide opportunities for students to earn a degree from a world-renowned institution and have the same great experience at Washington that I had. That’s a powerful legacy to leave behind,” says Michael, who graduated in 1997 with a degree in construction management. A fourth-generation Seattleite, Michael grew up in the U-District. His dad earned an accounting degree from Washington and his grandfather also attended the UW. Michael rowed in high school and stayed connected to the sport through friends who crewed for the Huskies. He met his wife, Sarah, while they both were students and they settled into a neighborhood a stone’s throw from campus. Michael contacted the Tyee Club, which set the wheels in motion for him to establish endowed scholarships for UW Rowing as well as for the UW History Department and Alpha Tau Omega in honor of his passion for history and his loyalty to his fraternity. “It was all easy and seamless, focusing on what my interests and goals were and then writing out a plan and an agreement to be sure our thinking was aligned,” he says, pointing out that all three donations combined to increase his priority points and improve his football seat location — an extra added benefit of making such a generous legacy gift. Learn more about the program, email or call us at 206.543.2234 to begin a conversation.